So I started tracing the ASM from 0x0807A3F8… it ended up spreading over about ten routines, including one that’s copied to IRAM ahead of time (had to boot the game and look at it with VBA to figure out the address and get the code, because it was indirected through an IRAM pointer). But I eventually got it all worked out, even “decompiled” to C more or less. /* This is done very indirectly. /* Verify header and checksum. /* Entry point that gets referred to in the event code. The in-IRAM routine is responsible for copying chunks of data from the SRAM (save file) to other RAM locations (it also has to set an I/O control register to adjust communication with the battery save, to make sure it doesn’t try to read faster than the data can actually be provided). There are a couple of calls to a routine that checks a byte value at 0x0203E79A in WRAM. My best guess is that this is set to indicate that save data is actually available. And then there are a couple of functions that appear to load a couple of structures from the save data, perform some checksumming and other validation, and then look at certain key values. A 100-byte structure is read from the very beginning of the save file. Twelve bytes are checked, from 20 (inclusive) to 32 (exclusive). If at least 7 of these are nonzero, the ASMC will return true. A 36-byte structure is read from offset 0x70d8 in the save file (so, a little over 28kb in). The last two bytes are a checksum; the two bytes before that (so, a short value at offset 0x70f8) is important to the code - if that value is nonzero, the ASMC will also return true. So. Anyone happen to know what’s stored at those locations in the save file? I’m just guessing, but maybe it has something to do with the connection with FE6. I mean, it makes reference to Canas’ Mother (Niime) and Hugh. Routine 080A038C is called when you view the Status screen. Looks like you need to complete the game 8 times to unlock Canas’s second death quote. Chapter 22 ending unlocks the 8 playthroughs bonus scene. Final chapter ending unlocks the 10 playthroughs bonus scene. 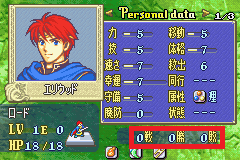 So it’s likely data transfer would have also unlocked Canas’s second death quote. I think I figured it out. It’s counting an array of unique playthrough IDs. The game doesn’t want the player to be able to increase the playthrough counter simply by replaying the final chapter or epilogue from the same playthrough. Near the end of the epilogue, the game calls routine 080A03C8 which adds parameter r1 (0202BBF8+0x18) to the playthrough ID array if the array has less than 12 elements and parameter r1 doesn’t appear in the array. I think it is used to display the B/W/L here (red box). And I remember its routine is at the end of the one for the status screen. Now I wonder if we could just give one playthrough ID while creating the save file so that players can begin our hack from the 2nd playthrough to enjoy more advanced functions such as a quick movement of units. 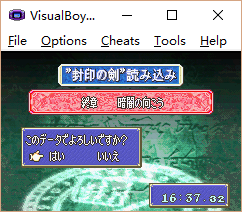 Anyway, I guess the “36-byte structure” has something to do with the FE6 save data transfer? The left one is FE7(J), and the right one is FE6(J). I read the 2nd save from FE6 to FE7.